As everyone is getting back to schools or jobs, field with a will of redemption prior to a few “too many bottles and parties” mixed with a will to get the best out of this new year, I wanted to take the time to share an edit that came 2 weeks ago but that is still worth to watch. 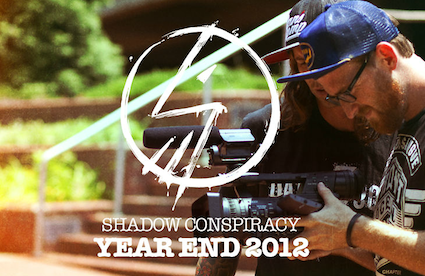 The Shadow Conspiracy, probably one of the closest thing you’d expect the BMX brand of your dreams to actually be, has released a Year End 2012 Edit. And I know since may brands have a look back on the year, it sometimes feels only like a marketing strategy, but what it is or should be is way more than this. Because it is in BMX, one of the function of a brand to write its own history and to share its own point of view on what has been going on in term of mood, riders, skills, moves etc. So, keep that one close first of all because it’s field with a whole lot of soulful moves and tricks but also because it is what might go down in history …..